If Willy Wonka were to run an Easter brunch, he’d probably do something like what the Eden Roc is doing, where every person who has brunch at 15 Steps - their farm-to-table restaurant - gets to scour the hotel searching for one golden egg. The prize? Sadly, not a tour of the Wonka Factory, but a far-less-bizarre and way more relaxing two night stay in an Eden Roc oceanfront suite. 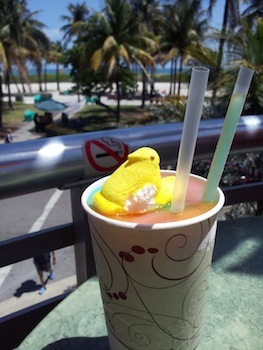 Nothing says Easter in Miami better than an Easter Egg hunt on the beach. And a giant smoked pig being carved up to the delight of everonye in attendance. That’s what you’re getting at the James Royal Palm where the 9:30 a.m. oceanfront hunt is followed by brunch at Florida Cookery with a giant pig carving station. 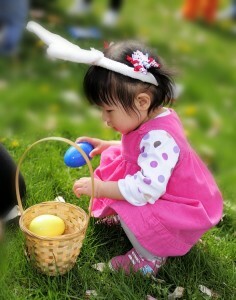 The Easter Bunny may or may not also be making an appearance. If you don’t like eggs….well, Easter is probably not exactly your favorite holiday so it’s doubtful you even made it this far into the article. Assuming you DO like eggs, there’s not a better brunch option for you this Easter than poolside at the Mondrian, where in addition to painting eggs by the pool you can eat them as omelettes, pickled eggs, deviled eggs, steak and eggs, egg white frittatas and Easter egg crostinis. EASTER EGG CROSTINIS! 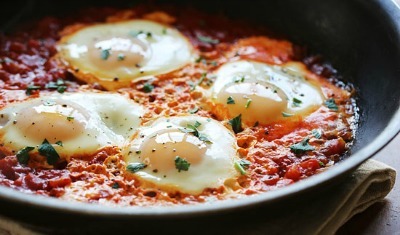 Or, if you want eggs AND Italian food, nobody’s doing that combination better than Lorenzo at the Redbury hotel, who’re offering up Eggs in Purgatory (eggs, spicy tomato sauce, fior di latte mozzarella, pecorino Romano and rosemary foccacia), Parma (two sunny side up eggs, Parma Cotto ham and fingerling potatoes), and Pizza Carbonara (eggs, La Queicia guanicale, Pecorino pepato, mozzarella and black pepper). Wash it down with your own crazy creation from their Bloody Mary Bar with homemade red chili paste, sausage, beef jerky, pickled tomatoes, Old Bay” pickles and pretty much anything else you might think to put in a Bloody Mary. Don’t let the traffic deter you from hitting one of South Beach’s best, off-the-tourist-path Italian restaurants. After all, we’ve got a trolley. And Macchialinas got a three-course, family style brunch that starts with scones, burrata and citrus cured salmon, goes on to steak and eggs and eggs Macchialina, and finished with the maple pecan butter-and-prosciutto Italian toast. Oh, and bottomless mimosas and Bloody Marys too. Bread before a meal is fun. Peeps before a meal, however, is downright entertaining. 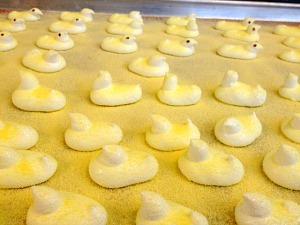 And even though you can’t get them the rest of the year, be sure not to fill up on chef Jamie DeRosa’s homemade peeps when they bring them out. There’s easter baskets with chocolate bunnies and two days worth of Spring lamb. The Dutch’s 3-course menu starts you out with a choice of whipped sheep’s milk ricotta; heirloom tomatoes; local field greens; traditional Peruvian corvina ceviche; or chilled spring asparagus soup. A second course lets you choose biscuit benedict; frisee aux lardons; or shrimp & grits, New England lobster roll and others. Then hit the dessert table for fresh pies, cookies, and cakes. Occasionlly, the courtyard at the Delano is home to something mildly family friendly and not, say, an all-night dance music party or Chris Paciello and Nikki Taylor making out in the pool. Such is the case this Sunday when Easter Bunnies will be hanging out from 11-2, an Easter Egg hunt will commence at noon, and after you can mosey upstairs to Bianca and much on Grilled Lamb Chops, Citrus and Peperoncini Glazed Ham Mini Carrot cakes and more..
Sunset Harbour’s steak kings are Eastering up their brunch this week. While they’ll still have the usual - $20 bottomless mimosas or$28 bottomless Bloody Mary’s, sangrias and mimosas - you’ll also find some cool new stuff like blue crab bread pudding Florentine, soft scrambled eggs with oysters and caviar, Fried Sweetbreads & Waffles and Pumpkin Pie Pancakes.